Make sure you keep your little Harry Potter fan dry at the beach or pool with this Hogwarts crest beach/bath/pool towel for boys and girls! Boys Harry Potter Hogwarts Crest Bath and Beach Towel 58x28 Red Yellow. Featuring the 4 crests of Hogwarts - Godric Gryffindor, Salazar Slytherin, Rowena Ravenclaw and Helga Hufflepuff. Bright yellow, red, green, black and blue colors!. This towel is perfect for the beach, bath and pool. 100% cotton, Soft, thin and lightweight. Approximately Measures: 28"W x 58"L. Officially Licensed Harry Potter Merchandise. 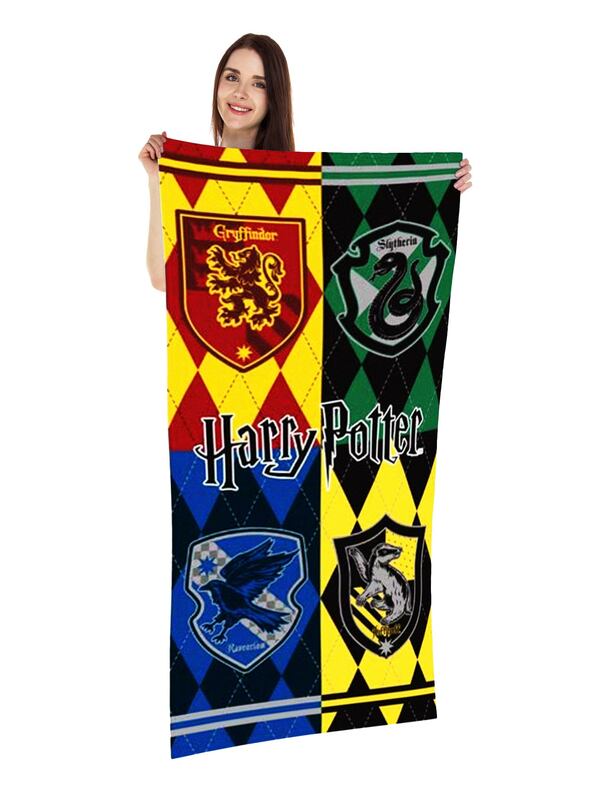 • Boys Harry Potter Hogwarts Crest Bath and Beach Towel 58x28 Red Yellow. Featuring the 4 crests of Hogwarts - Godric Gryffindor, Salazar Slytherin, Rowena Ravenclaw and Helga Hufflepuff. Bright yellow, red, green, black and blue colors!. This towel is perfect for the beach, bath and pool. 100% cotton, Soft, thin and lightweight. Approximately Measures: 28"W x 58"L. Officially Licensed Harry Potter Merchandise.